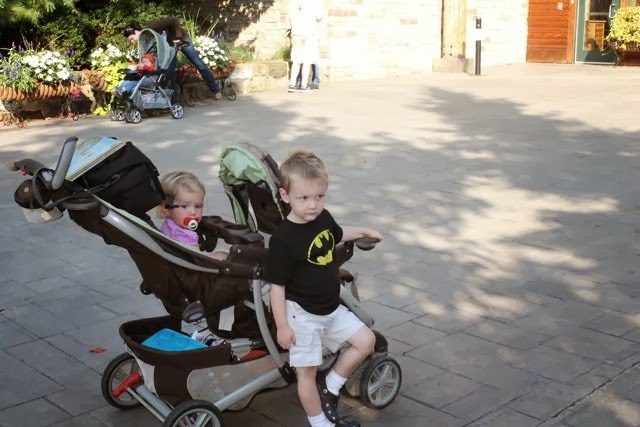 My family has had many memorable experiences at the zoo. 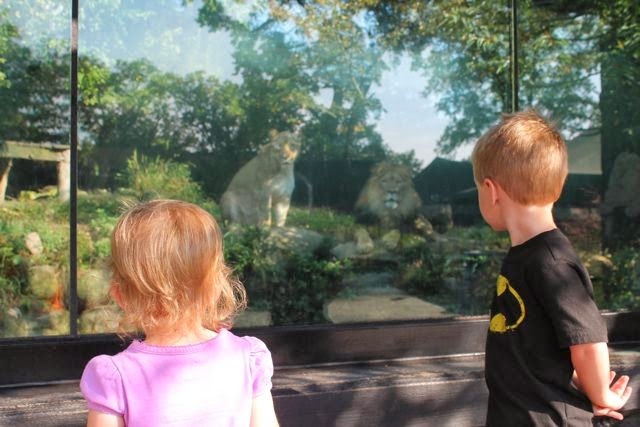 There have been countless weekday and weekend visits that have taught us so much about animals and conservation. My son's first birthday party brought together both sides of our family for a memorable celebration. I even had the best job as a zoo educational interpreter (a.k.a docent) for two summers. 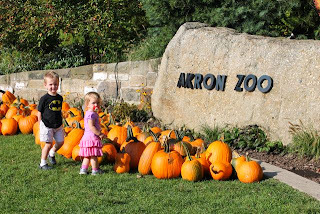 This week, we added another author birthday celebration to our growing list of memorable reading experiences at the zoo. The author birthday celebrations that we have had at the zoo have all been remarkably different. Each visit was shaped by a picture book which gave us a new perspective on a place we have visited so many times before. 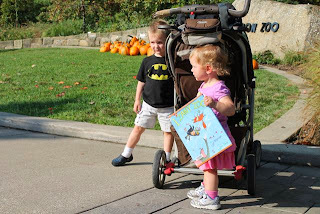 I encourage you to take picture books to the zoo on your next visit. 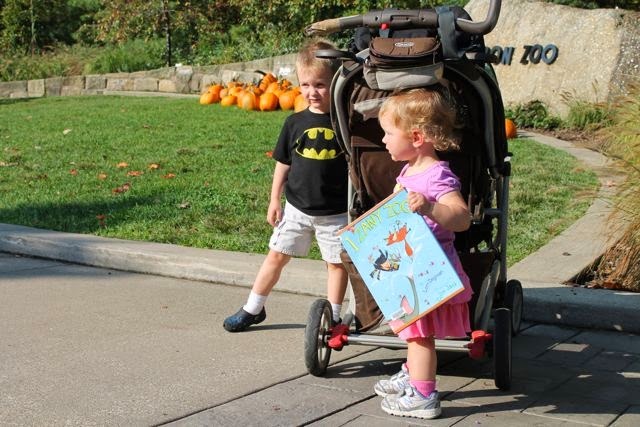 Bring picture books that feature your child's favorite animals or animals that you want to learn more about. You could even read a picture book about the zoo. This week, we read a picture book about a zoo that we think would be perfect for your next visit. 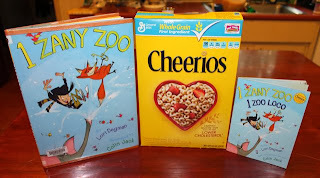 Lori Degman is the author of 1 Zany Zoo which was the winner of the 2008 Cheerios New Author Contest. It was a story that she wrote over twenty years ago, but raising a family and working as teacher for deaf and hard-of-hearing students prevented her from pursuing publication. Then, inspiration struck, maybe because life was slightly less hectic, and Lori revised, tweaked, and perfected her story. It won the grand prize, was included in over 2.2 million Cheerios cereal boxes, and was later published as a full-size picture book by Simon and Schuster. (First Book). 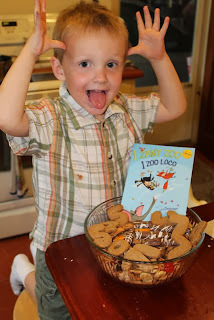 1 Zany Zoo is about a boy who sneaks into the zoo early and is amused by the animals and their shenanigans. It all starts with one fearless fox who steals the zookeeper's keys and before you know it ten rowdy bears are leading a zoo parade! This book is a joy to read aloud because of the rhyming text. It also has a counting element that inspired this week's birthday celebration activity for Lori Degman. 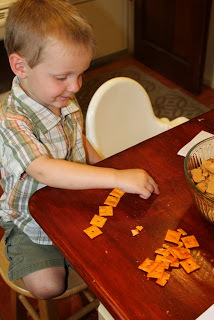 The idea for our activity started with Cheerios cereal and sifting through tons of fun snack mix recipes on Pinterest. I didn't find exactly what I was looking for and decided that we would invent our own snack mix. Our first task was to make graham crackers in the shape of numbers. 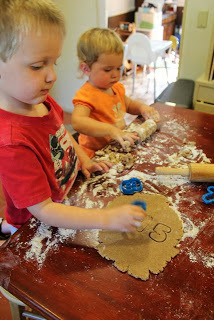 We chose to make our own because I couldn't find crackers or cookies shaped like numbers at the grocery store. I am glad there wasn't any at the store because these crackers were tasty! (Click here for the recipe.) The only change we made to the recipe was that we cut out numbers instead of making rectangles. It was time to combine everything together. 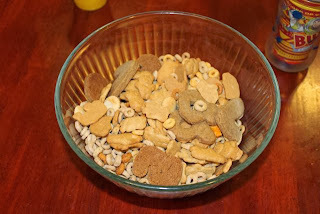 We added animals crackers, fruit snacks, Cheerios and more! We worked on counting the crackers before we put them into the mix. 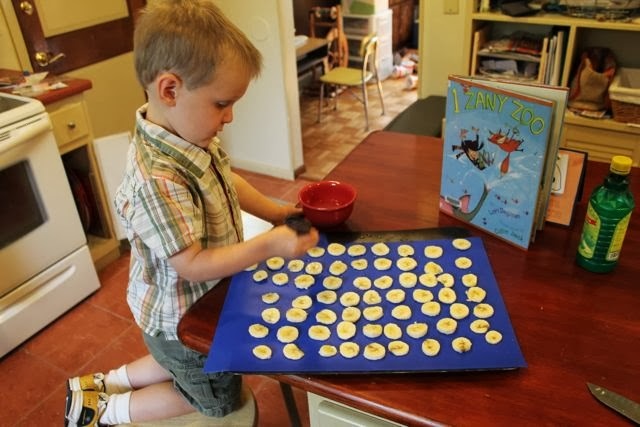 These square-shaped crackers were added because the leopards in the book were redesigning their spots to be different shapes. Introducing......1 Zany Zoo Crunch! 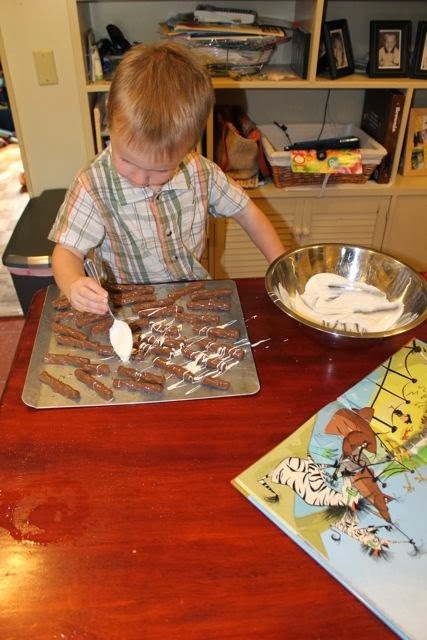 10 yummy ingredients inspired by a great book -- both are sure to bring smiles to your child's face! 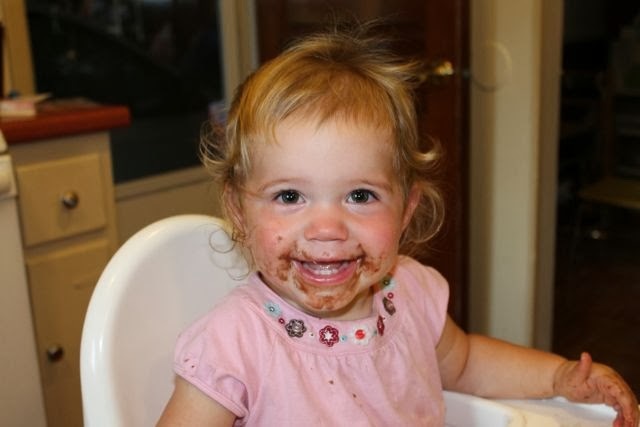 And maybe even a chocolatey smile! My older two children returned home from school and within about ten minutes half of the 1 Zany Zoo Crunch disappeared. Luckily, we had extra ingredients for our visit to the zoo the next day. we also had a good book to read which made for a pleasant wait. I have visited the zoo so many times before, but we have never counted the animals at each exhibit. 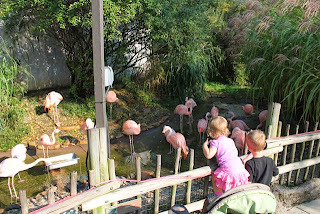 Because of 1 Zany Zoo we found out that there are 23 flamingos at our zoo (not all pictured in this photograph). 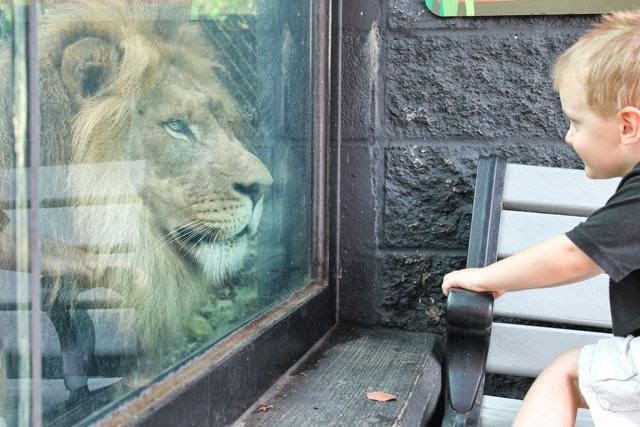 There are also two beautiful African Lions. Tamarr the lion had a stare down with my son! 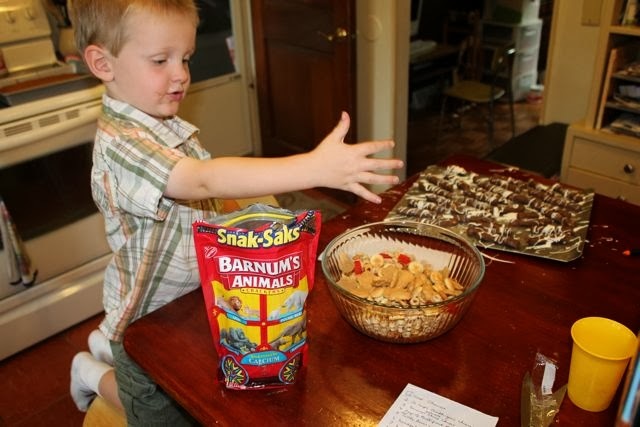 5 Pouches of Teddy Graham crackers (10 rowdy bears led a big zoo parade in the book). I think my best birthday story is the story of my birth. When my mother was pregnant with my twin sister and me, she didn't know she was having twins. They didn't have ultrasounds back in the day and she had already had two big babies, so they figured baby #3 was another big one. Anyway, when my mother went into labor six weeks early, she had some complications so they did an emergency c-section. They did surgery and took out my sister, Julie. The doctor began stitching up my mother and suddenly shouted, "Oh my gosh, there's another one in there!" And I became baby #4. Lori -- My children and I had so much fun reading your book. We hope you have ZANY birthday! Thank you so much for taking the time to share your birthday story!